AADL and the Ann Arbor Area Transportation Authority (TheRide) are partnering this summer for a fun, new addition to this year’s summer game! Every Friday in August, AADL cardholders can ride any of TheRide’s local fixed-route buses for free. The only item you need to take out of your wallet is your AADL Library card. Show the driver your card and ride for free! While you ride, look for the summer game code sign inside the bus and win 1,000 points to trade in for great Summer Game Shop prizes. It’s easy – there’s only one code to find, repeated on every single bus. When you see it, text the code to 4AADL (42235) or visit play.aadl.org to enter the code and get 1,000 points. •	Find the codes at bus stops nearest to any AADL location for 500 points. •	Codes are also hidden on TheRide’s website - TheRide.org. New to the AADL summer game? Last year, there were 5,476 active summer game players who were awarded 85,850 badges and selected 7,227 prizes. Will you be a player this year? Visit play.aadl.org or text NEW PLAYER to 4AADL (42235) to get started. The Performance Network, formerly an Ann Arbor professional theater group, enters Old News in 1982 with the article “Their corner of the world’s a stage”. “Our immediate aim is to be studio or work space,” explained David Bernstein, one of Performance Network’s co-founders. For the first two years, Performance Network was a place for directors, playwrights, actors and stage crew to develop their professional skills. A unique feature was the “Works-in-Progress” series, stage readings of plays followed by a discussion with the playwright. Among them was Rachelle Urist, a reporter for the Ann Arbor News, who had her play, "Just Friends,” stage read and later developed into a full production. Opening their doors was the play, "We Won’t Pay, We Won’t Pay,” which heralded the era of Performance Network. Stay tuned for additional articles, photographs, programs, and more, from Performance Network's long history. Independence Day, the Fourth of July, or July 4th, however you wish to refer to the nation’s official founding day, it is the one and only big summer holiday. It rings in the country’s separation from the British Empire (a sort of Brexit of our own), and, for some, the start of summer. With BBQ’s, picnics, fairs, parades, and fireworks, fireworks, fireworks being sold and shot off all around town, now is a great time to look back on our own history of Fourths’ gone by. There's no better place to see some great pictures as well as articles from the historic Ann Arbor News than the library’s very own Oldnews site. If you remember a guy who dressed up as a clown nurse or another who brought a skunk to the parade, you can see them on Oldnews. Wonder what fireworks were available back in 1961? See them on display here. Remember the Buhr Park fireworks? Relive a moment in time from one of those events in 1963 or read the article about it. And of course there are plenty of parades. You can see the Ypsilanti High School's Girls Drum & Bugle Corps or the Boy Scouts, Troop 88 float in different Ypsilanti parades. But by far the favorite is the Greenbriar Subdivision kid’s parade. But if enjoying the beach is more your speed, Groome's Beach circa 1963 may give you ideas for celebrating the Fourth in a more relaxed manner. Any way you celebrate, enjoy a safe and happy holiday! AADL Deputy Director Eli Neiburger with U-M student interns James Bueche, Chase Richmond, and Matt Jozefczyk. In a ceremony this morning in the Downtown Library Lobby, AADL accepted a generous donation of two Universal Gaming Carts with adaptive game controllers. The carts provide people with disabilities a way of inclusion into the gaming world, using gaming equipment designed to make it easier for people with movement challenges to play regular commercial videogames. Funding was made possible from Mott Golf Classic in partnership with Mott Family Network. The mobile gaming carts were assembled as an extension of the Mott Family Network’s Pediatric Gaming Project at Mott Children’s Hospital and named “Universal” rather than “Adaptive” Gaming Carts to make clear their inclusive approach. Mott Family Network envisions people with disabilities using these carts to play alongside non-disabled peers in healthy competitions and they will be used at future AADL tournaments. The carts were donated in the names of Jamie Mayo (Senior Rehabilitation Engineer in the Department of Physical Medicine and Rehabilitation at the U-M Hospital) and Dr. Ann Orr (Special Education Professor in the College of Education at Eastern Michigan University), in honor of their time and dedication provided to families and patients with assistive technology needs. Mott Family Network is a non-profit, all volunteer organization funded by the Mott Golf Classic providing assistive technology to the U-M’s C.S. Mott Children’s Hospital and its patients. Mott Family Network is in partnership with EMU and U-M. Through donations from Mott Golf Classic, student interns from both universities provide support for MFN initiatives. AADL is greatly appreciative of this donation and looks forward to welcoming a broader audience into the Library's regular gaming events. Mott Family Network Intern Jared Long contributed to this press release. Inside today's museum is a memorial to the zoo which explains "...In 1929, a University of Michigan alumnus anonymously offered a collection of live native Michigan animals. It was the donor's hope that the animals could be enjoyed by children staying in the hospital then located across the street. A circular animal house and pond known as the "Museum Zoological Park" were constructed behind the Museums Building." 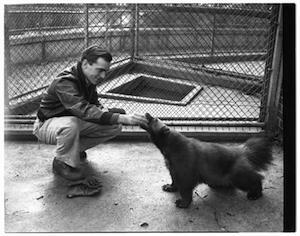 Old news articles and photos show zoo residents like badgers, a bobcat, red foxes, skunks, otters, raccoons, several pairs of black bears throughout the years, and a wolverine named Biff. At some point a "reptile pit" was added, which included snakes and turtles. In 1938, elaborate plans surfaced for a forty acre zoological garden to be located near the University of Michigan hospital. A WPA grant was "expected to provide the finances" for a wildlife utopia, where animals of the tiny U of M Zoo would be turned loose to live with no cages. The location of this dream zoo, which never came to fruition, seems to be the edge of what is now Nichols Arboretum. Despite the popularity of the U of M Zoo, it was torn down in 1962 to make room for an addition to the Ruthven Museums Building. A few Ann Arbor City Council members, as well as many Ann Arbor townspeople, appealed to the University Board of Regents to save and/or relocate the beloved 30something year old zoo, but eventually the animals were relocated and the zoo became a memory. By today's zoological standards, the animals of Ann Arbor lived in fairly terrible, tiny, cramped quarters. The "Animal House", as it came to be called, never grew to be a wildlife utopia, but certainly provided countless Ann Arbor children and their families the opportunity to appreciate Michigan wildlife up close. Who doesn’t love a parade? And Memorial Day certainly is full of them. Ann Arbor is no exception either. Whether it is the Ann Arbor High Marching Band or Brownie Scouts or just groups of kids watching the parade, we have gathered some wonderful articles and photos. In addition to parades there are other commemorations for this holiday and for Armed Forces Day as celebrated in Ann Arbor. You can find them all here. All Library locations will be closed on Memorial Day Monday, May 30. Regular Library hours will resume on Tuesday May 31. Come see the new fairy door in the Downtown youth area! Visitors to the Downtown Library in recent months might have noticed that the fairy door area was “under construction.” Just this week we installed a BRAND NEW fairy door and fairy door fans of all ages will definitely want to come check it out! Located in the same spot as the old fairy door, in the Downtown Youth Department, this new door is super special. You can peek inside to see an adorable scene with a tiny desk, fairy-sized chairs and pillows and little books. There’s even a cute hanging plant—in a thimble, of course! And, this fairy door has a special light that allows you to really see the details that make it so special. Each time you look inside, you’ll notice things that you hadn’t before—like how the walls are papered with dozens of images from old books. The new fairy door is really a treat—come see for yourself! This week marks the 60th anniversary of the opening of the 'New' Ann Arbor High School in April 1956. Old News has published the photos and articles that tell the story from students campaigning for new digs in February, 1953 to the first commencement in June, 1956. Voters had barely passed the bond when the earth movers starting clearing the old Stadium Hills Golf Course to make way for the new high school. There are great shots of the construction and the various buildings that make up the complex. A cornerstone ceremony was held in December, 1954, led by the AAHS Marching Band. 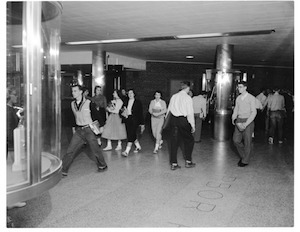 By May, 1955, the building was ready for a Student Council inspection and in November, 1995, the School Board sponsored a public tour that brought a real crowd to the site. 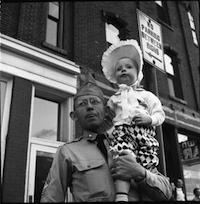 Moving-in started in earnest in February, 1956. On March 30th an army of student volunteers turned out to help AAHS staff to fight the mud and get the school ready for opening day, April 9, 1956. Students filled the halls, tested the equipment, hit the books and had some fun at the not-quite-finished school. Check out the lunch room. While the new school filled up, 'Old' Ann Arbor High School at State & Huron emptied out and silent hallways awaited remodeling by the University of Michigan as the Frieze Building. The official public tour of the new high school was held on April 15, 1956 and thousands turned out. Guests were welcomed at the door, toured a sleek new lobby, and attended a formal dedication. You can view the original Dedication Program on Old News. On June 14, 1956, the first Commencement was held at the new high school, featuring both an 1891 graduate and an engagement. Many of the photos we've published on Old News never appeared in the Ann Arbor News so be on the lookout for townies you know. Digitize Your Photo Collection with a Portable Scanner! The Magic Wand Portable Scanner is just one of many great Tools at the Ann Arbor District Library that you can check out with your library card. With its easy to use functions this scanner is great for scanning large amounts of photos in minutes. Insert 4x6, 5x8 or 8x10 prints into the auto feeder and the scanner will do the rest. And anything larger can be scanned by hand; just detach the scanner from the docking station and you're instantly mobile! Other features include color or monochromatic scan selection, 300/600/1050/1200 DPI scan quality selection and a color display to playback the scanned images. So instead of spending countless hours using a flatbed scanner for your next project use this one instead! To celebrate National Poetry Month, AADL has joined with the Ann Arbor Area Transportation Authority for poetry on the bus! In the spirit of the 2006 Poetry Bus and following in the footsteps of Vancouver's Poetry Moves and the Poetry Society of America's Poetry in Motion campaigns, AADL and AAATA have introduced two placards in each AATA bus with excerpts from great poems by John Keats, Li Po, Elizabeth Barrett Browning, Claude McKay and others. Then head over to the library to check out more poetry! All AADL locations will be closed on Easter Sunday, March 27. Regular Library hours will resume on Monday, March 28. Where can you find out more about arts & culture in Ann Arbor? Where can you get updates on music? Visual art? Author and book events? Film & video? Theater & dance? With AADL's new arts blog, Pulp, you'll find excitement and appreciation for the Ann Arbor area arts & culture scene and all it has to offer. Visit Pulp for previews, thoughts, critiques, reviews, dorky puns, opinions, and observations from professional journalists, community contributors, and, of course, your very own AADL staffers. Learn about a new art exhibit at the University of Michigan Museum of Art, read a review of a film currently playing in Ann Arbor theaters, and even get a head start on summer plans with a preview of offerings at the Stratford Festival. Find out more at A2pulp.org! The community weblog MetaFilter invites members to contribute to discussions through links and comments. Common threads on the site run the range from advice to news stories, all the way to the Internet’s favorite: cat videos. One recent thread brought out Ann Arborites and Ann Arbor District Library fans with mentions of our Tools Collections. Commenters were especially excited about our Music Tools, raving over the OP-1 synthesizer and controller and Local Musician Dave Menzo’s album Shhh…, made using only instruments checked out from AADL. The thread also mentions some unusual collections at other libraries across the country. You can check out our tools for yourself in the library catalog, and read the full thread on MetaFilter. This week in the Michigan Daily, columnist Susan LaMoreaux shares her fondness for the Ann Arbor District Library. She highlights AADL programs, services, and community partnerships, including our ever-popular Tools Collections and PALMA: Proyecto Avance: Latino Mentoring Association, run through the University’s Residential College. She interviews our own Laura Raynor, who explains how AADL looks at the community when developing new services and collections. You can see her full column on the Michigan Daily website. Online electronic music site Synthtopia typically covers all things electronica: electronic music gear, new releases, artists, and synthesizers, but this week they’re covering something a little closer to home: The Ann Arbor District Library! Synthtopia profiles our Music Tools collection and mentions our wide range of synthesizers, effects pedals, amps, and uncommon musical instruments. Interested in checking out this equipment for yourself? Visit aadl.org/musictools to see all our music gear, and see aadl.org/tools for our full range of Tools collections, including Art Tools, Home Tools, Science Tools, and more! 2016 marks the 80th anniversary of the former Ann Arbor News Building at 340 E. Huron St. - the only commercial building in Ann Arbor designed by renowned architect Albert Kahn. Watch the above slideshow to see the construction of this iconic art deco-style building, week by week, from the first shovelful on August 28, 1935 through its completion at the end of January, 1936. Between January and April 1936, the News building was outfitted with furnishings, equipment and a new printing press. On May 21, 1936, an open house was held for the public. Longtime News photographer Eck Stanger took dozens of photos of interior spaces and staff after construction was completed, including the News room and equipment operators, and he continued to shoot photos of staff at work writing, composing, printing, and delivering the News through 1937. The Ann Arbor News occupied the building until the paper's first print-run closure in 2009. It is now owned by the University of Michigan Credit Union. View all photos of the new Ann Arbor News building. You can also catch a related exhibition, "Albert Kahn: Under Construction", at the University of Michigan Museum of Art (UMMA), now through July 3, 2016. 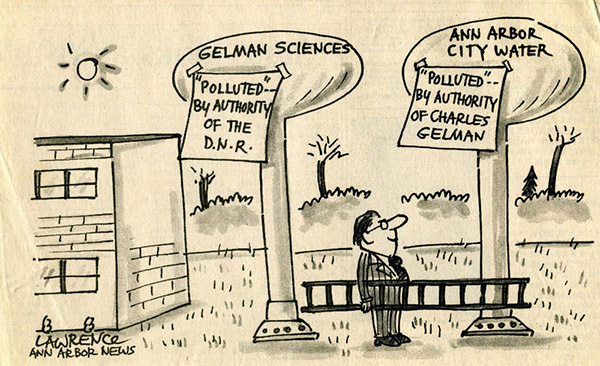 The Pall-Gelman 1,4 dioxane groundwater contamination has a long and troubled past in Ann Arbor history. AADL Archives staff, with the assistance of Scio township resident Roger Rayle, founder and leader of Scio Residents for Safe Water, has posted over 1,000 historical articles, editorials, letters to the editor and photos from the Ann Arbor News covering the history of the Pall-Gelman dioxane groundwater contamination cleanup from the late 1960s, when Gelman Sciences (now the Pall Corp.) pumped contaminated water into a holding pond at their 600 S. Wagner facility, through the close of the first iteration of the Ann Arbor News in 2009. Coverage includes not only attention-grabbing headlines but considerable detail about the company's earnings, personnel changes, and related environmental concerns at the state and local level throughout this period. The discovery of the 1,4 dioxane in water wells in the 1980s caused a public outcry and set off much finger-pointing and several legal battles between the Pall-Gelman Corporation; Scio township residents; the city of Ann Arbor; and the state of Michigan concerning responsibility for the cleanup that's now stretched over three decades. Former Ann Arbor News assistant metro editor Lynn Monson has written a special feature story for Oldnews to bring readers up to date as the dioxane plume continues to spread toward the Huron River. Congratulations to Leni Sinclair, recently named the 2016 Kresge Eminent Artist! AADL was privileged to work with Leni on the events and website surrounding the 40th anniversary of the John Sinclair Freedom Rally in 2011. You'll find several of Leni's photographs relating to the Rally and her years in Ann Arbor on AADL's Freeing John Sinclair site. Here you can also listen to an interview with Leni in which she recalls the origins of the Detroit Artists Workshop and their strategic retreat to Ann Arbor following the Detroit Riots, or a joint video interview with John Sinclair on their memories of the 1971 Rally. Read Leni's essay about her life in Ann Arbor's Hill House commune, or check out her work in Detroit Rocks (2012), co-authored with Gary Grimshaw. This month Old News travels back 65 years to January 29, 1951 and the grand opening of Eberwhite School. We found a wealth of material on Eberwhite so we've posted over 200 articles and photos all the way back to the original land swap with the University of Michigan, the laying of the cornerstone in 1950, construction, and the hundreds of events and milestones throughout the years. Many of the photos we've posted were never published in the Ann Arbor News so we don't have names to go with the faces. We'd love to hear from the alumni, faculty and families of Eberwhite to make the history more complete. There was plenty of other local news reported on the 29th. Fire destroyed the Riverside Bar and Bowling Alley in Ypsilanti. The Ann Arbor Public Schools announced the first annual Bands In Review program featuring bands from Ann Arbor High School and Slauson and Tappan Junior Highs. On the sports front, Dave Dingman dominated the All-City Skating Meet at Burns Park. The University of Michigan opened its track season with a meet that featured a mysterious missing lap in a medley relay. While the Kiwanis thanked city residents for their generous support of the fundraising Rummage Sale, an Ann Arbor News editorial wondered why the citizens of Washtenaw county were failing to support the Polio Drive. Weddings and births were announced, plays produced and movies promoted. Television replaced radio as the mainstay of home entertainment with shows like Kukla, Fran and Ollie, Milton Berle and Studio One. Our favorite advertisement of the day was the Modern Appliance Co. display ad for the amazing Spindrier that featured several ladies dancing, celebrating and hugging the appliance. A lot more happened at AADL this past year. Check out our full annual report to find out more! This month Old News travels back 80 years to December 17, 1935. Local news dominated the front page that day with the major announcement of the merger of three banks, Ann Arbor Savings Bank, the Farmers and Mechanics Bank, and First National Bank and Trust Co. The merger, in the middle of the Great Depression, was seen as reassuring move in an otherwise shaky banking industry. Economic conditions dominated other local news as the Ann Arbor Public School announced federal funding for nursery schools and adult education. The WPA plan for a "practice house" where girls from relief families would be trained as housemaids was also unveiled. Even the Letters to the Editor were concerned with the Depression as a citizen called on neighbors to drop their opposition to a home for orphan children in the 7th ward. Perhaps related to the dire economic conditions (or not), the Courts took up the case of the stolen hog. Many of the holiday traditions familiar to Ann Arborites took center stage in 1935. A front page article predicted that thousands would listen to the University Choral Union's Messiah at Hill Auditorium. The Community Sing, begun in 1931, was promoted with a full-page display complete with lyrics to all the favorite Christmas songs for the expected 10,000 carolers. The University of Michigan's Subscription Dance was becoming so popular organizers had to limit ticket sales. The local schools were not to be outdone with the Tappan School students putting on a production of Dicken's Christmas Carol. Check out the list of players and you may recognize a Townie. The annual Yule Lighting Contest deadline was extended to give citizens plenty of time to decorate their yards. Amateur sports were big, really big, in 1935. Amateur boxing nights at the Armory drew big crowds and prominent coverage in the News. Mill Marsh, the News sports columnist, mused on the growing popularity of Wolverine hockey and basketball. Intrepid wrestling coach Cliff Keen regaled the Ann Arbor Kiwanis with a description of the drama of Big Ten conference matches. So what kind of routine news would you find in the Ann Arbor Daily News in 1935? Plenty. Birthdays were celebrated, marriage license announced, deaths noted, weather data recorded, and the ever-present promotional contests, with readers competing for prizes with funny verses. Readers looked to the radio listings for their favorite programs and the theater ads for the latest films from Hollywood. Much has changed in Ann Arbor in 80 years but it's amazing to note how many business are still around. Moe Sport Shop, celebrating 100 years in 2015, had a gorgeous display ad to tempt holiday shoppers. Kroger Co. gave cooks a list of the most-needed holiday items. Arbor Springs reminded readers to stock up on water for the holiday dinners. Stay tuned to Old News for more Way Back Days. It seemed like a good idea in January,1996: To deal with overwhelming demand for placements at Community High School, AAPS would hold a lottery for the first 50 slots and then the rest could wait in line "for a few days" before the April 1st sign-up date. Except the line started at 8:45 a.m. on Sunday, March 17th when Tappan Middle School student Maisie Wilhelm lined up outside the Balas Building. And they came, and they came and they came, with tents, and cook stations and couches and campfires. Parents set up temporary homes in vans, temporary offices in tents, and a Line-Up headquarters. Hopeful middle-schoolers played Hacky Sack (remember Hacky Sack? ), strummed guitars (of course), and exhibited almost-Community High cool. This being Michigan and March, a late-winter storm hit Ann Arbor on March 20. By March 27, the Ann Arbor News had seen enough of frozen kids and sacrificing parents and called for an end to the Line-Up in favor of an all-lottery system. Apparently the situation got so tense a Community High School student had to remind News readers it was the AAPS and not the students who lined up who caused the Line-Up debacle at Balas. April 1, 1996 finally arrived and a cold and wrapped-up Maisie was officially welcomed by Community High School dean Judy Hamilton Conger. And by April 2, Superintendent John O. Simpson had read enough Letters to the Editor, seen enough images of tents and announced that AAPS would move to a lottery system for filling slots at all three alternative schools. And thus ended another chapter in the colorful history of Community High. Westgate Branch has Closed for Expansion! Westgate Branch, the smallest and oldest of AADL branches, closed for expansion on Friday, November 20 at 9:00 pm. It will reopen in mid-2016 with 21,000 square feet, creating a new, modern branch for the community. Item Requests for West Branch pickup will be sent to Pittsfield. You can call the renewal line at 734-327-4219 to have your items moved to another branch if you prefer. Drop boxes will not be available at West Branch until the project is complete. Items can always be returned at any other AADL location. For more information about the upcoming expansion, visit westgate . Thanks for your patience as we work to bring you an amazing new Library! It was 41 years ago on Sunday, December 1, 1974, that the snow started falling, and falling, and falling. By the time the storm stopped on December 2nd, Ann Arbor had recorded it's biggest snowfall since records began in 1880 -- a total of 19.8 inches. Thousands of travelers were stranded throughout Washtenaw County. US 23 was a mess and cars were stuck on all county roads. City, County, Schools and organizations sprang in to action, housing folks, providing bed, blankets and meals for the weary voyagers. In Ann Arbor, buses were waylaid, the University of Michigan closed and townies handled the storm with typical aplomb , true grit and seasonal humor. The Lopez kids got down to work, the University of Michigan students got arty and cars stayed buried for days. Check out all the photos and articles on Weather at Old News -- we're always adding more weather-related content. Good news, Everyone! The Westgate Branch, the smallest and oldest of the Ann Arbor District Library branches, is about to expand. Earlier this year, Westgate Branch neighbor Sun & Snow relocated out of the Westgate Mall. Pictures Plus will also relocate to a new Westgate location at the end of this month. These vacancies provide AADL with an opportunity to expand a popular branch location that already experiences over 200,000 visits per year. 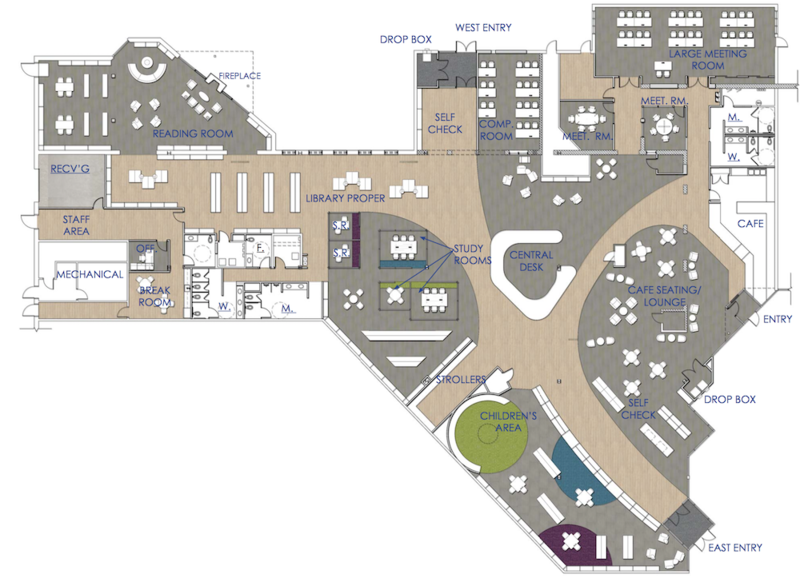 AADL Trustees have signed a lease to expand the Branch and construction is expected to begin in November 2015 with an expected opening in summer 2016. Westgate Branch will close November 20 so that construction can begin, and staff working at that location will be re-assigned to alternate locations during the construction period. Construction costs will be paid upfront by Westgate Management and AADL will reimburse Westgate Management up to 1.2 million of the construction costs over the first 8 years of the lease. In addition to expanding the Library for the convenience of current users, AADL is looking forward to welcoming many new patrons. AADL’s past openings of Malletts Creek, Pittsfield and Traverwood Branches all saw remarkable increases in use at each new branch, as well as across the Library system. Updates on this project will be posted on the library website. For more information, visit westgate. This week, The Ann Arbor District Library and our tools collection were featured in the New York Times in an article about non-traditional library collections. Several libraries around the country, including AADL, are profiled, each with a unique collection to share. The article can be read on the New York Times website or on page A12 of the Tuesday, September 15 edition of the Times. If you’d like to check out a tool, from a Spinning Wheel to a Telescope, or a Giant Checkers Set and a Thermal Camera, visit aadl.org/tools! Watch Bo Schembechler's first season unfold in real time! How can this Wolverine football season get any more exciting? We found a way! Now you can revisit one of the University of Michigan's most exciting seasons ever - Bo Schembechler's first campaign as head coach in 1969 - in real time as reported in the Ann Arbor News. From pre-season coverage and that thrilling first game against Vanderbilt University, through the shocking Ohio State upset and the trip to the Rose Bowl in January, who knows what treats await? We've already uncovered Millie Schembechler's famous crab dip for your tailgate party! Follow our coverage of Bo's entire 1969 football season via twitter or tumblr and ... GO BLUE! The October, 1970 Michigan - Michigan State football match provided one of the weirder twists in the long interstate rivalry that is known simply as "The Game." A former Michigan Daily sports editor, Joel Block, filed a lawsuit to block the game, citing it as a "public nuisance." Block was protesting the pre-emptive canceling of the Goose Lake Music Festival due to perceived widespread drug abuse at a previous concert. Preparations for The Game continued as the team and the AAPD finalized plans for defense, offense and crowd control. And then the day before the game, Washtenaw County Judge Ross W. Campbell issued one of his more popular decisions, dismissing the lawsuit as "patently frivolous." And The Game? Hail To The Victors ruled the day at Michigan Stadium as the Wolverines battered MSU, 34 - 20. The Spartans suffered injuries and Billy Taylor did everything right for Bo. The final twist on the lawsuit came as the Ann Arbor Police reported October 17, 1970, one of the quietest Michigan - Michigan State games ever.